Two weeks already? Ghana has a fantastic way of making time go incredibly slow and fast at the same time. When you are waiting for a tro-tro (mini bus) to fill up, knocking back unwanted offers of meat on a stick, in the mid-day heat and humidity, it feels like the seconds are minutes and the minutes are hours. However, it barely feels like any time at all since Dave Thorp and I set down at Kotoka airport at 5am on June 18th. He’s currently in the air heading back to the UK so now seems like a good time to evaluate some of the work we’ve done so far. Hosting serial fundraisers and supporters, Adrian and Marion Coles (my dad and mum), and giving them a taste of the work we do. I’m really happy to say that we ticked every box. It was great to see the work that has been happening in Ghana since Dave and I were last here in 2011. Two new schools have had renovation work done on them, Mama Viak’s has had a new kitchen built, Dynamo FC has gone from strength to strength and KickStart Ghana is really starting to build a name for itself in the community for recruiting determined and competent volunteers and providing funds to help Ghanaians develop the community that they live in. Probably the most important of the above tasks was for Dave, Daniel and I to sit down and really think about what type of organisation we want KickStart Ghana to be in the future. Over the past five years it has grown rather organically and whilst we are extremely proud of the work we have done we want to make sure we remained focused, have a clear vision and mission, a set of aims we are working towards and joint values that all those involved with KickStart Ghana adhere too. With the wonders of modern technology it is really easy to communicate via Skype, Facebook and mobile phone but nothing can beat sitting down face to face to discuss these sorts of issues. Although we’re still polishing a few edges on our new strategy we’re really pleased with what two days of fairly intense discussion produced. Whilst we want to reach as many people as possible we also want to offer support for individuals who want to better themselves and the society that they live in. We look forward to revealing how we will do this in the coming weeks. Preparation for almost twenty people to come and live and work in Ghana is always a rather busy time. We’ve been making sure the KickStart Ghana house is welcoming and hospitable, reacquainting ourselves with reliable hotels in Accra, getting induction procedures ready and working with the local schools and football teams that will be hosting the volunteers. We’re fairly practiced in this art after five years though and we are confident that this will be the best summer yet for KickStart Ghana volunteers. Finally, we’ve been delighted to welcome my mum and dad to Ghana, and Ho in particular. They are big supporters of the charity in the past having completed fundraising events and just recently match funding a section of my Paris Marathon fundraising target. They were keen to see the work that KickStart Ghana has been up to and I believe that they were really pleased to see how their money has made a real difference to young people growing up in Ho. This isn’t the first time we’ve welcomed supporters to Ghana, the fundraising legend that is Stefan Courtney visited before and it’s something we are always really happy to do. Well as I write this blog our first volunteer of the year, my lovely girlfriend, Anna Gilthorpe is flying over the Sahara Desert so I better be off to meet her at the airport. 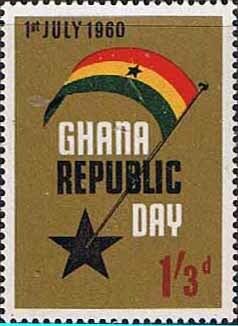 Happy Republic of Ghana Day to everyone too.